Attleboro, 1 @ Franklin, 2 – Final (8 Inn.) – Franklin senior Colby Fitzgibbons laced a two-out single into left center field to drive in Shane O’Neil as the Panthers walked off with a win over Attleboro. Fitzgibbons had two hits on the day, Steve Luttazi had an RBI, and Jake Macchi had a hit and a run scored for Franklin. Bryan Woelfel struck out 10, walked one, and scattered six hits in 6.1 innings of work. Attleboro threatened with runners on first and third in the top of the seventh but Jason Ulrickson (1.2 IP, win, 2 K) made an appearance in relief, getting a strikeout and then Attleboro was caught trying to steal home. Attleboro’s Matt Callahan (two hits) reached base four times, Alvaro Espinal had two hits and an RBI and Ryan Morry had a hit and a run scored. Eoin Kelleher allowed just four hits while striking out six. Canton, 5 @ Foxboro, 10 – Final – Foxboro exploded for six runs in the fourth inning to break open a 3-3 game and never looked back to beat the visiting Bulldogs. Robert Theriault had a big day for the Warriors, going 3-for-4 with three RBI while Joe Freitas (RBI, two runs) and Joe Cavaleri (run) each had two hits. Chad Bearce added a double and an RBI for Foxboro. Steve McLaughlin struck out four, walked four, and allowed six hits in four innings of work while Sean Yoest struck out four and allowed five hits in three innings of relief. Canton’s Matt Pigeon went 3-for-3 with two runs, Nate Quan had three hits and two RBI, and Jake Aronson had two hits and an RBI. King Philip, 1 @ Mansfield, 3 – Final – Mansfield was limited to just one hit but cashed in on its opportunities to beat King Philip. Sophomore Chris Jenkins drew a walk in the third inning, stole second and came around to score on two passed balls. Jenkins reached on an error in the fifth and came around to score after a throwing error on Michael Hargadon’s bunt. Sam Nugent executed a safety squeeze to bring Hargadon home from third. Connor Sheehan earned the win, striking out seven with one walk and six hits allowed in a complete game effort. KP’s David Morganelli was the tough-luck loser, allowing just one hit with seven strikeouts and four walks in a complete game. Liam Rohan had a hit and a run scored for KP. North Attleboro, 6 @ Milford, 2 – Final – North Attleboro went on the road and clinched at least a share of the Davenport division title with a win over Milford. Big Red’s offense got off to a strong start with two runs in the first inning behind a Nick Sinacola RBI double (Brendan McHugh single, run) and a Zach DeMattrio triple and passed ball. Sinacola added another RBI in the third with a single that plated Aidan Harding. Milford cut the deficit to two with a run in the bottom of the third when Justin Applebee scored on a single from Matt Shaver. North responded with two runs in the top of the fourth when Nate Pearce drove in a pair with a double. Big Red added an insurance run in the sixth when Sinacola (three hits) singled and eventually scored on another double from Pearce. Aidan Wilde added an RBI single in the bottom of the seventh for Milford. Peter Cohen pitched a complete game for North, scattering six hits while striking out three. Oliver Ames, 5 @ Taunton, 1 – Final – Oliver Ames did all of its damage offensive during the second inning, plating all five of its runs in the frame. Jacob Levine (2-for-4) and Mitch Goulet each had two RBI hits in the inning while Jake Erlich had two hits and had a strong game behind the plate for the visiting Tigers. Michael Mulrean struck out nine with just two walks in 5.2 innings of work without allowing an earned run. Jakob Roberts was 2-for-3 with an RBI and Logan Lawrence added two hits for Taunton. Stoughton, 7 @ Sharon, 0 – Final – Stoughton’s Zak Paquette needed just 80 pitches for the complete game shutout, allowing four hits with one walk and five strikeouts. Evan Gibb (2-for-3, three runs, stolen base) and Mike Nazzaro (2-for-3, RBI) led the Black Knights’ offense. Franklin, 4 @ Attleboro, 0 – Final – Franklin junior Jackie Cherry struck out nine in a complete game shutout to lead the Panthers to a win on the road. Franklin scored a pair of runs in the first, built a 3-0 lead in the second and tacked on an insurance run in the seventh inning. Ally Shea went 2-for-2 with an RBI and Maddy White reached base twice, scored once, and had an RBI. Franklin’s Peyton Arone helped end an Attleboro threat in the fourth, making a catch in left and getting a double play at second. Mansfield, 0 @ King Philip, 12 – Final (6 inn.) – King Philip’s Jess Bonner launched a pair of home runs and Faith Turinese threw a no-hitter as the Warriors blanked Mansfield. Bonner finished with five RBI, Allison Kuchy had a three-run home run, and Hailey McCasland contributed three hits for KP. Turinese didn’t issue a walk and struck out seven in a complete game effort. Milford, 5 @ North Attleboro, 1 – Final – Milford junior Emily Hartman had a day to remember at the play and senior Emily Piergustavo set a new program record in a win on the road at North. Hartman went 3-for-4 with a double and a three-run home run, finishing with five RBI. Piergustavo had two hits, including the 144th of her career to set a new Scarlet Hawk record. Kate Irwin (double, triple) and Maddie Bonvino each added two hits. Kelley Reichert earned the win, allowing just five hits with four strikeouts in a complete game. North scored its lone run in the fifth inning when Olivia Capobianco drove in Andrea Miceli with a single. Oliver Ames, 3 @ Taunton, 9 – Final – Jaime Brown had two hits and knocked in three runs and Kya Enos added two hits and an RBI to lead Taunton past OA. McKenzie McAloon also had two hits, including a double, while scoring two runs. Jaylin Couto struck out nine with two walks and five hits allowed in seven innings of work. OA scored three runs in the first inning with Caroline Mahoney (1-for-3, RBI, run) knocking in Lexie Campbell (2-for-4, run) on a double to right center. Katie Abreu and Rachel Han each knocked in a run in the first inning as well. Sharon, 0 @ Stoughton, 12 – Final (6 Inn.) – Stoughton’s offense belted a season-high 19 hits while Gina Carafa allowed just two hits in six innings of work for the Black Knights. Jordan Lyons led the offense by going 4-for-4, Brianna Ferrandiz was 3-for-4 with an RBI, Karly Estremera had a two-run double, and Val Whalen and Sarah McGrath each had two hits and an RBI. Franklin, 6 @ Foxboro, 7 – Final (2 OT) – Click here for a recap and photo gallery of this game. Stoughton, 0 @ Oliver Ames, 20 – Final – Oliver Ames’ Eric LeBlanc was one of nine Tigers to find the back of the net in a win over Stoughton. LeBlanc scored his 100th career goal in the win while Nick Gillis recorded the shutout. Canton, 11 @ Taunton, 10 – Final – Maggie Connolly and Leah McClellan both had hat tricks for the Bulldogs, as Canton pulled out a second straight one-goal win. Connolly also had an assist. Kaitlyn Goyetch scored twice and assisted on two other goals, while Molly Colburn and Caroline Tourgee both scored twice and Alexa Maffeo had a goal and an assist. Attleboro, 3 @ Sharon, 17 – Final – Sharon coach Shara Ginthwain said that the Eagles “played great as a team” with six different goal scorers and assists on eight of the goals. Rose Wald made eight saves in the Sharon goal. Foxboro, 5 @ Franklin, 11 – Final – Click here for a Recap and Photo Gallery from this game. King Philip, 18 @ Milford, 2 – Final – Lauren Anderson paced the Warriors with four goals and Caroline Klim had a hat trick and an assist. KP also got a pair of goal from Ali Wilson and single goals from Claire Lawler, Callie Sullivan, Victoria Tormey, and Christina Hathaway. North Attleboro, 17 @ Mansfield, 19 – Final – Katy Garvin scored seven times and Hannah Sternburg made 15 saves as Mansfield pulled out an important win on senior night. Olivia Murray scored a hat trick and Ann Maher, Hayliegh Crawford, Lauren Whitman, and Emily Vigeant all scored two goals for the Hornets. Maggie Danehy also scored in the win. Katie Lindstrom scored nine goals for the Rocketeers in the loss. Franklin, 5 @ Attleboro, 0 – Final – Franklin freshman Liam Marr didn’t lose a game in his match and the Panthers won all five in straight sets to pick up a win on the road. Marr won 6-0, 6-0 at second singles, Rohan Herur recorded a 6-2, 6-0 win at first singles, and Saketh Saripalli won 6-1, 6-1 at third singles. The team of Tony Calderone and Shoumik Sompally prevailed 6-2, 6-1 at first doubles and Tyler DiPalma and Tyler St. Marie lost just one game in a 6-1, 6-0 decision at second doubles. Mansfield, 1 @ King Philip, 4 – Final – King Philip’s Sean Desroches and Nate Ihley rallied from a one-set deficit to pick up a win at first doubles in KP’s 4-1 win over Mansfield. Desroches and Ihley won 5-7, 6-4, 6-3 while Nick Ihley and Aidan Ignatius prevailed 6-2, 6-2 at second doubles. Nick Putney dropped just two games in a 6-2, 6-0 win at second singles and Jack Cannon earned a 6-2, 7-5 win at third singles for KP. Mansfield’s Luke Nickerson won 6-1, 6-4 at first singles. 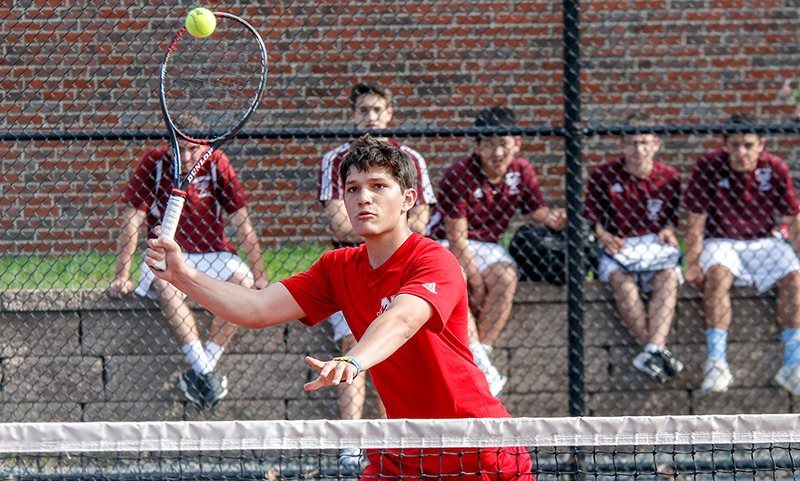 Milford, 1 @ North Attleboro, 4 – Final – North Attleboro’s Alex Rinaldi and Sam Gallagher didn’t drop a game in their match at second doubles to help the Rocketeers beat Milford. Rinaldi and Gallagher won 6-0, 6-0 while Ben Pfeffer and Vikram Senthilakumaran won 6-2, 6-1 at first doubles. Richard Bermudez and Jonah Manso both won 6-0, 6-0 at first and second singles, respectively, for North. Milford’s Zach Austin won 6-3, 6-4 at third singles. Oliver Ames, 0 @ Taunton, 5 – Final – Taunton lost just two games total between its five matches to move within a game of qualifying for the state tournament. Francois Hennaux won 6-1, 6-1 at first singles while Brett Beaulieu (second), Mike Briggs (third), Charlie Fiske and Dylan Kullas (first doubles) and Kyle Dennehy and Trevor Hart (second doubles) all won 6-0, 6-0. Sharon, 5 @ Stoughton, 0 – Final – Sharon senior Andre Olivei prevailed in a tiebreaker to pick up a win over Stoughton freshman Waseem Sablon to complete the Eagles’ sweep. Danujan Thirumavalavan won 6-0, 6-1 at second singles and Ashwin Sreevatsa didn’t lose a game in a 6-0, 6-0 win at third singles. Max Brody and Russell Rapaport won 6-0, 6-0 at first doubles and Alex Aspel and Jake Ross won 6-2, 6-0 at second doubles for Sharon. Canton, 0 @ Foxboro, 5 – Final – Freshman Pamela Nelson prevailed with a 6-3, 6-4 win at second singles over Canton freshman Natalie Keppler in a battle of two of the best young players in the league to help Foxboro earn the win. Sophia Prinos won 6-1, 6-0 at first singles and Kayla Prag won 6-1, 6-3 at third singles. The team of Sarah Prag and Julia Muise earned a 6-1, 6-2 win at first doubles and Olivia Dantona and Kendall Milender picked up a 6-1, 6-3 victory at second doubles. King Philip, 5 @ Mansfield, 0 – Final – King Philip won all three singles matches in straight sets in a sweep at Mansfield. Erin Regnier won 6-1, 6-1 at first singles, Meghan Sepich picked up a 6-0, 6-1 win at second singles, and Caitlin Gonser was victorious (6-2, 6-2) at third singles. Grace Ely and Mia Valencia prevailed with a 6-2, 7-6 (4) win at first doubles and Lucy Barnard and Katarina Schneider won 6-2, 6-0 at second doubles. North Attleboro, 5 @ Milford, 0 – Final – North Attleboro earned its third straight 5-0 sweep, this time taking down Milford on the road. Jordan Willis won 6-1, 6-0 at first singles, Emily Chiasson didn’t lose a game at second singles, and Tara Nair won 6-1, 6-2 at third singles. Azka Siddiq and Shurobhi Nandi teamed up for a 6-2, 6-0 win at first doubles and Leah Marceau and Samantha Martino won 6-2, 6-2 at second doubles. Taunton, 3 @ Oliver Ames, 2 – Final – Taunton’s second doubles team of Amanda Pugh and Brianna Fevrier emerged with a win in a three-set thriller to help the visiting Tigers pick up a win. Pugh and Fevrier won 6-4, 6-7 (2), 6-2 to help Taunton win. McKenzie Lucie and Samantha Martin won 6-2, 7-5 at first doubles and Jillian Pagliuca picked up a 6-2, 7-5 win at first singles. OA’s Tate Hadges lost just two matches in a 6-1, 6-1 win at second singles and Maura Kiernan picked up a 6-2, 6-1 win at third singles for the host Tigers. Stoughton, 0 @ Sharon, 5 – Final – Sharon’s Alysha Posternak played in her first varsity match, teaming with with Lauren Glass to pick up a 6-2, 6-2 win in doubles play. Emily Wen won 6-2, 6-0, at first singles, Katie Merport earned a 6-0, 6-0 victory at second singles, and Sachi Bhasin didn’t drop a game in a 6-0, 6-0 decision at third singles for the Eagles. Oliver Ames, 3 @ Attleboro, 0 – Final – Oliver Ames scored two runs in the second, added another in the third and stranded 13 Attleboro base runners to earn a win on the road. CJ Deveau had a two-RBI hit in the second inning to give Oliver Ames the lead while Chris Pearsons (double), Jake Erlich, and Matt Muir each scored for the Tigers. Tom Parker earned the with five scoreless innings of work while Muir got the save, striking out two in the seventh. Ryan Morry allowed five hits and two walks, striking out three in a complete game effort for the Bombardiers. Sharon, 1 @ Canton, 2 – Final – Sharon tied the game at 1-1 in the top of the seventh but Canton came back with the game-winning run in the bottom half, walking off with a win over the Eagles. Mike Konzal led off the bottom of the seventh with a double and scored on a base hit down the first base line from Nate Quan for the win. The Dogs took the lead in the fourth off when Matt Casamento (double) scored on a passed ball. Sharon’s Ben Stamm singled in the top of the seventh to tie it. Robbie Wilkinson tossed a complete game for Canton, striking out six and walking four with just three hits allowed. Sharon’s Max Tarlin also threw a complete game, striking out six with three walks and seven hits allowed. Foxboro, 7 @ Milford, 1 – Final – Foxboro senior Devin Hassett allowed just one hit in 3.2 innings of work and sophomore Anthony Mollica didn’t allow any hits in 3.1 innings of relief to lead the Warriors to a win on the road. Milford took a 1-0 lead (Aidan Wilde three walks, run) into the sixth inning but Foxboro exploded for seven runs in the frame to take the lead. Joe Freitas (1-for-3) had two RBI while Joe Cavaleri and JT Burke each had two hits and an RBI in the win. Matt Rongione and Hassett each added a hit and an RBI for the Warriors. Franklin, 3 @ Mansfield, 10 – Final –Click here for a recap and photo gallery of this game. Taunton, 11 @ King Philip, 1 – Final – Taunton’s offense had its best showing of the season, scoring two runs in each the third, fourth, fifth innings and then putting the game out of reach with a five-run sixth inning. Jacob Crawford led the Tigers with three hits while Jack Moynihan (two RBI), Jakob Roberts, and Tyler Medeiros each had two hits. Tyler Pietrzyk had a team-high three RBI for the Tigers. Moynihan tossed five scoreless innings for the win, striking out three. Stoughton, 1 @ North Attleboro, 2 – Final – North Attleboro rallied with two outs in the bottom of the seventh to earn a walk off win over visiting Stoughton. Brendan McHugh got things going with a two-out single and then stole second to get into scoring position. Nick Raneri delivered the big hit with a single to right center to bring McHugh (1-for-2, walk, two stolen bases) home for the win. North took the lead in the fifth inning when Nick Sinacola had a one-out single, pinch-runner Jackson Billingkoff moved to third on a single from Zach DeMattio, and Billingkoff scored on a squeeze dropped by McHugh. Stoughton kept the game alive with a run in the top of the seventh behind a leadoff single from Zak Paquette. Pinch runner Jack Brown stole second and took third on an infield hit from Ruben Gonzalez. Brown then scored on a sacrifice fly from Evan Gibb. Stoughton had Gonzalez in scoring position with just one out but Nick Sinacola (CG, 8 H, 1 BB, 8 K) got two strikeouts to keep the game level. Nate Pearce added two doubles and a walk in the win for North. Attleboro, 4 @ Oliver Ames, 2 – Final – Oliver Ames freshman Emma Varella struck out four in a complete game effort but the Tigers fell just short against Attleboro. Katie Abreu was 2-for-3 with two doubles and a run scored. Abbi Holmes had an RBI and Lexie Campbell scored the other run for the Tigers. Canton, 11 @ Sharon, 4 – Final – Canton sophomore Caroline Hughes went 4-for-4 at the plate with a pair of doubles and three RBI while freshman Liz Bickett also was 4-for-4 with a double and two RBI to lead the Bulldogs to a big win on the road. Hughes also pitched four scoreless innings to earn the win. Sarah Kelly added a double, Torie Anglin chipped in with a triple, and Ally Chin had a pair of singles for the Bulldogs. Milford, 19 @ Foxboro, 6 – Final – Milford’s offense exploded for 22 hits, earning a big win on the road at Foxboro. Shannon Cormier (double, two runs, two RBI), Sabrina Haarstick (RBI), and Maddie Bonvino (double, two RBI) each had three hits to lead the Hawks’ offense. Emily Hartman (four RBI, two doubles), Jess Tomaso (three runs, RBI), and Emily Piergustavo (triple, three runs, RBI) added two hits apiece. Kelley Reichert struck out three while allowing three hits in four innings pitched. Mansfield, 1 @ Franklin, 9 – Final – Franklin’s offense continued to roll, plating nine runs to sweep the season series against Mansfield. Franklin scored runs in all but two innings, plating three in each the second and fourth innings. Jackie Cherry tossed a one-hitter, striking out nine to earn the win in the circle. Maddy White (two doubles, run, three RBI) had three hits for the Panthers while Gabby Colace (two runs, RBI), Anna Balkus (three runs, three stolen bases, two RBI) and Meg Caron chipped in with two hits apiece. Megan Letendre had the lone hit of the game for the Hornets, doubling in the fourth inning to score Kara Bendanillo, who had reached on a walk. King Philip, 3 @ Taunton, 4 – Final –Click here for a recap and photo gallery of this game. North Attleboro, 8 @ Stoughton, 2 – Final – Andrea Miceli had a two-out single to drive in a run in the fifth and Olivia Capobianco broke the game open with a three-run homer in the sixth inning. Bella Erti picked up the win, striking out five and allowing four hits, and helped her own cause with a pair of hits and an RBI. Abby Gallagher and Katherine Munley each had three hits for the Rocketeers, while Ashley Cangiano (two RBI) and Katy Daby both had two hits. Stoughton’s Karly Estremera was 1-for-3 with a triple, scoring both of the Black Knights’ runs. Jordan Lyons was 2-for-3 at the plate and played an outstanding game at shortstop. Haley Stone, Sarah McGrath, and Taylor Levine each had a single for the Knights. Canton, 11 vs. Scituate, 10 – Final (OT) – Click here for a Recap and Photo Gallery from this game. Oliver Ames, 19 @ Taunton, 0 – Final – Oliver Ames’ Steve Heino registered a shutout in his second career varsity start. The Tigers’ offense was balanced with 11 different goal scorers, led by four from Owen Gallagher and three from Colin Bourne. Canton, 14 vs. Brookline, 13 – Final – Vicki Revanche made 21 saves to help Canton earn a one-goal victory on senior night. Canton coach Laurie Chabot said, “We controlled the game with quick transition, great defense and great shots on goal.” Leah McClellan sparked the Bulldogs offensively with four goals and six assists, while Maggie Connolly added two goals and two assists. Senior Molly Colburn chipped in with a hat trick in the win. Franklin, 8 vs. Walpole, 9 – Final (OT) – Sophomore Gianna Cameron made 15 saves to keep the Panthers in the game, helping send the game against unbeaten Walpole to overtime, but the Rebels netted the winner to prevail with the win. Annie Walsh had three goals and an assist, Erin Walsh scored once and had an assist, and Kate Jones finished with two goals for the Panthers. Mansfield, 8 @ Sharon, 12 – Final – Rose Wald had a big game for the Eagles, making 15 saves in the win. Sabrina Robbins led the Sharon attack with three goals and an assist, while Emma Eberhardt added two goals and two assists. Lydia Chase and Maeve Barbera each scored twice for the Eagles and Jenna Goldstein, Abbi Solomon, and Cass Barbera each had one goal apiece. Taunton, 11 @ Oliver Ames, 17 – Final – Taunton freshman Alana Tavares scored six goals, including the 100th of her career in the loss. Canton, 0 @ Sharon, 5 – Final – Sharon didn’t lose a single game in four of the five matches to earn a convincing win on the road at Canton. Fred Bondar (first singles), Andre Olivei (second), Arie Chinnappan (third), and Max Brody and Russell Rapaport (first doubles) all won 6-0, 6-0. The team of Alex Aspel and Eric Zhang earned Sharon’s fifth point with a 6-3, 6-3 win at second doubles. Mansfield, 2 @ Franklin, 3 – Final – Franklin picked up two wins in singles play and another in doubles to slip past the Hornets in a close match. Liam Marr picked up a big point with a 6-1, 1-6, 6-1 win at second singles, Saketh Saipalli didn’t lose a game at third singles, and the team of Tony Calderone and Dan Angermeier won 6-3, 6-1 at second doubles. Mansfield’s Luke Nickerson won 6-3, 6-2 at first singles and the team of Jalaj Singh and Sethu Odayappan won 6-7 (6), 6-2, 10-6 at first doubles. King Philip, 4 @ Taunton, 1 – Final – Taunton’s Francois Hennaux saved six match points at first singles en route to a 6-2, 2-6, 7-5 win but King Philip won the other four matches to get the victory. Nick Putney won 6-3, 6-2 at second singles, Jack Cannon earned a 6-0, 6-3 win at third singles, the team of Nate Ihley and Sean Desroches rallied for a 5-7, 6-1, 6-0 win at first doubles, and Nick Ihley and Aidan Ignatius won 6-2, 6-1 at second doubles for the Warriors. North Attleboro, 5 @ Stoughton, 0 – Final – North Attleboro won all five matches in straight sets to get a sweep on the road. Richard Bermudez won 6-2, 6-2 at first singles, freshman Jonah Manso earned a 6-3, 6-2 win at second singles, and sophomore Alex Pfeffer notched a 6-2, 6-0 win at third singles for Big Red. The team of Vikram Senthilakumaran and Ben Pfeffer won 6-0, 6-3 at first doubles and Alex Rinaldi and Sam Gallagher notched a 6-0, 6-0 win at second doubles. Oliver Ames, 5 @ Attleboro, 0 – Final – Oliver Ames’ Sarah Barron won a third set tiebreaker and the team of Olivia Groebe and Rachel Stryke rallied back from a one-set deficit to highlight the Tigers’ sweep of Attleboro. Barron won 7-5, 3-5, 10-4 at third singles while Tate Hadges (first singles) won 6-3, 6-4 and Maura Kiernan (second singles) earned a 6-3, 6-2 win. Groebe and Stryke rallied for a 3-6, 6-2, 6-1 win at first doubles while Emily Yu and Eva Belanger took a 6-2, 7-5 decision at second doubles. Sharon, 5 @ Canton, 0 – Final – Sharon won all five matches in straight sets to earn a win on the road over Canton. Nupur Shukla won 6-1, 6-2 at first singles, Lulu Yuan earned a 6-1, 6-2 win at second singles, and Emily Win prevailed 6-0, 6-1 at third singles. The team of Rithika Neti and Sophia Fein won 7-5, 6-4 at first doubles and Ellie Romantz and Makaila Cheung picked up a 6-3, 6-4 win at second doubles. Foxboro, 5 @ Milford, 0 – Final – It was a clean sweep for the road Warriors, winning all five matches in straight sets. Sophia Prinos (first singles) and Pamela Nelson (second singles) each won 6-0, 6-0 while Kayla Prag earned a 6-1, 6-1 decision at third singles. Foxboro’s first doubles team of Sarah Prag and Julia Muise won 6-0, 6-1 while the team of Olivia Dantona and Kendall Milender picked up a 6-1, 6-2 victory at second doubles. Franklin, 1 @ Mansfield, 4 – Final – The Hornets defended home court by winning two singles matches and sweeping doubles play against visiting Franklin. Sarah Doyle picked up a 6-0, 6-1 win at first singles and Elizabeth Elsner followed suit with a 6-1, 6-2 win at second singles. The team of Tessa Garufi and Hannah Podolske dropped just one game in a 6-1, 6-0 victory at first doubles, and Samantha Sternburg and Aryana Khosravani won 7-5, 6-3 at second doubles. Franklin’s Lucia Kehoe won 6-3, 6-2 at third singles. Stoughton, 0 @ North Attleboro, 5 – Final – North Attleboro punched its ticket to the state tournament with a sweep of visiting Stoughton. Jordan Willis (first singles) and Emily Chiasson (second) each won 6-0, 6-0 while junior Mae McLoughlin earned a 6-2, 6-1 win at third singles for Big Red. Azka Siddiq and Katie Ovoian won 6-2, 6-0 at first doubles while Shurobhi Nani and Brototi Nandi picked up a 6-0, 6-4 victory at second doubles. Taunton, 3 vs. North Quincy, 0 – Final – After beating North Quincy on the road in five sets earlier this season, the undefeated Tigers flexed their muscles on home with a clean sweep (25-22, 25-15, 25-20). Lance Law paced the attack with 14 kills and an ace, Lens Esquil added 10 kills and five blocks, and Collin Hunter chipped in with three kills, three blocks, and three aces. Bishop Feehan, 4 @ Attleboro, 8 – Final – Attleboro plated three runs in the third inning and added four more in the fifth inning in a win over visiting Bishop Feehan. Eoin Kelleher tossed a complete game, scattering five hits to earn the win. Tim Callahan paced the offense, going 3-for-3 with two runs, two stolen bases, and an RBI. Jon Candiales, Dakota Kirby, and Mason Houle all had two hits for Attleboro. Canton, 3 @ Mansfield, 14 – Final – Canton scored three runs in the top of the fifth inning to make it a three-run game but Mansfield exploded for eight runs in the bottom half to create a big lead. Mansfield scored two runs in the first, three in the second, and one in the fourth to build its lead. Tyler Dalton continued his strong week, going 3-for-4 with four RBI and two runs scored, Kevin Dow had two hits, three RBI, and two runs scored, and Dan Saraceno had two RBI and one run. Connor Sheehan struck out nine with four hits and four walks allowed in four innings of work for the Hornets. Canton’s Jake Aronson went 2-for-4, including a three-run home run in the fifth inning. Franklin, 5 vs. Catholic Memorial, 1 – Final – Franklin senior Colby Fitzgibbons went a perfect 4-for-4 at the plate and classmate Bryan Woelfel tossed a complete game with just one run allowed to lead the Panthers to a win over CM. Woelfel scattered nine hits while walking just one, striking out eight. Fitzgibbons added an RBI and a run scored while Jake Macchi (two RBI, double), Steve Luttazi (double, run), and Jack Nally (double, run) all finished with two hits for the Panthers. Jake Noviello and Alex Haba each added a hit and a run scored. Oliver Ames, 5 vs. Dighton-Rehoboth, 2 – Final– Oliver Ames junior Sean O’Brien’s three-run double highlighted a five-run second inning for the Tigers. O’Brien (2-for-3, two doubles, run) cleared the bases to put the Tigers ahead while Mitch Goulet (2-for-3) and Chris Pearsons (double, walk, run) each had an RBI during the inning. Michael Mulrean (four strikeouts, one hit) and Matt Muir (two strikeouts, no hits) combined for four innings of relief. Mansfield, 9 @ Canton, 6 – Final – Canton scored four times in the fourth inning to take a 6-3 lead, but the Hornets scored a pair of runs in the fifth to cut the lead to one and then took the lead with four runs in the seventh. Ashlyn Conley had a bases loaded double with one out in the seventh to bring in the go-ahead and eventual game-winning runs for Mansfield. Caty DeMassi added an insurance run with a deep sac fly to left and Ella Verheggen singled in the ninth run of the game and fourth of the inning. The Hornets had 16 hits on Thursday, including three from Kara Bendanillo and two each for Megan Letendre, Felicity McMullin, DeMassi and Verheggen. Mary Muldoon, Kerran Holmes, Grace Benton, and Sydney Woods also had hits in the win. Oliver Ames, 7 vs. Braintree, 9 – Final – OA’s Kayla Georgeu was 1-for-2 with a run scored, Katie Abreu went 2-for-3 with a run scored, Rachel Han had three RBI and a run scored, and Sarah Tetrault and Abbi Holmes (run) each had two hits for the Tigers. Sharon, 7 vs. Ursuline Academy, 10 – Final – Courtney Sollis hit a homer that gave Sharon a 3-0 lead early in the game and also tripled in the sixth inning. North Attleboro, 18 @ Canton, 6 – Final – Mackenzie Rosenberg had six goals and Katie Lindstrom added five as North Attleboro bounced back from Wednesday’s loss with a big road win. Julia Dakin added four goals, Julia Tolfa had two and Maggie O’Brien scored once. Kayla Moulin made nine saves for the Rocketeers. Mansfield, 5 @ Canton, 0 – Final – Mansfield’s double teams combined to lose to just one game in the Hornets’ sweep of Canton. Jalaj Singh and Sethu won 6-1, 6-0 at first doubles while Danny Radev and Ben Salden took a 6-0, 6-0 decision at second doubles. Luke Nickerson didn’t lose a game in a 6-0, 6-0 win at first singles, Max Bank picked up a 6-4, 6-1 win at second singles, and Nilay Pangrekar won 6-4, 1-6, 10-8 at third singles. Sharon, 5 vs. Bishop Feehan, 0 – Final – Sharon bounced back from its first loss of the season with a convincing 5-0 sweep of visiting Bishop Feehan. Fred Bondar rallied for a 6-7 (3), 6-3, 10-3 win at first singles, Andre Olivei earned a 6-0, 6-0 decision at second singles, and Danujan won 6-0, 6-1 at third singles. Max Brody and Russell Rapaport teamed up for a 6-0, 6-1 win at first doubles while Arie Chinnappan and Ashwin Sreevatsa bounced back with a 6-3, 6-2 win at second doubles. Canton, 4 @ Mansfield, 1 – Final – Canton won all three singles matches in straight sets and earned one more win in doubles play to get a win over Mansfield. Natalie Keppler (first singles) and Rachel Kupferman (second singles) each won 6-1, 6-1 while Sarah Hernandez won 6-1, 6-3 at third singles. Canton’s first doubles team rallied for a 4-6, 6-4, 10-7 win. Mansfield’s Samantha Sternburg and Aryana Khosravani won 6-2, 7-6 (5) at second doubles. Sharon, 5 @ Bishop Feehan, 0 – Final – Sharon won all five matches in straight sets and only lost game total between its three singles matches in a win over Feehan. Nupur Shukla (first singles) and Lulu Yuan (second singles) each won 6-0, 6-0 while Emily Wen earned a 6-0, 6-1 decision at third singles. The team of Sophia Fein and Rithika Neti won 6-3, 6-2 and Makaila Cheung and Lauren Glass emerged with a 6-5, 6-3 win at second doubles. That was the case on Wednesday afternoon as the North Attleboro boys tennis team beat Sharon, snapping the Eagles’ 123-match unbeaten streak against Hockomock opponents. The last time Sharon suffered a loss to a Hock opponent was May 7th, 2010 — predating the league splitting into two divisions. The Rocketeers won all five matches, winning a pair of matches in straight sets while taking three others after three sets of play. Senior Richard Bermudez won 6-2, 6-4 at first singles, senior Christian Bermudez won 6-3, 4-6, 6-1 at second singles, and freshman Jonah Manso battled back to earn a 4-6, 7-6 (4), 6-3 win at third singles. The team of senior Ben Pfeffer and Vikram Senthilakumaran pulled out a win after three sets (6-3, 2-6, 6-3) and sophomore Alex Pfeffer and Sam Gallagher won an all-important tiebreak in the first set to gain momentum for the second, prevailing 7-6 (5), 6-3. Sharon, which has won 38 straight league titles dating back to 1980, lost to the Rocketeers 3-2 in 2010. After that, they finished the season with six more league wins before going 14-0 in each 2011 and 2012. They went unbeaten in league play (16-0) in each of the last five years and won the first nine matches of this season. North’s first point came from Richard Bermudez at first singles. Both Richard and his twin brother Christian are in their first year with the Rocketeers after transferring in from Venezuela. In a quick first set, Bermudez won 6-2 against Sharon’s Fred Bondar, who has been one of the top singles players in the Hock over the past couple of seasons. Bondar grabbed a 2-1 lead in the second set but Bermudez battled back, winning three straight to go up 4-3. They each won a game before the North Attleboro senior was able to finish it off and get Big Red its first point. The Rocketeers’ second point came from first doubles. The team of Ben Pfeffer and Senthilakumaran fell behind 1-2 to Sharon’s Max Brody and Russell Rapaport but rallied to win five of the next six games to take the first set 6-3. Brody and Rapaport proved why they are one of the top doubles teams in the area by bouncing back with an impressive 6-2 win in the second set. But Pfeffer and Senthilakumaran settled back down, taking the final three games to earn a 6-3 win in the third set to put the Rocketeers up 2-0. North sealed the win by getting its second win in doubles play, as Alex Pfeffer and Gallagher won in straight sets. After leading 5-2, Sharon’s Arie Chinnappan and Ashwin Sreevatsa battled back to win the next three games to make it 5-5. They split the next two games, forcing the first set into a tiebreaker. Pfeffer and Gallagher trailed 1-2 and 2-3 before eventually tying it 4-4. Sharon closed the gap to get within one, down 6-5, but the Rocketeers finished it off to take the first set 7-6 (5). That momentum carried into the second set where Pfeffer and Gallagher won 6-3, securing the win for North. Although the win was intact, North’s Christian Bermudez (second singles) and Jonah Manso (third singles) continued to battle in the third set. Christian Bermudez won the first set 6-3 but Sharon senior Andre Olivei battled back to take the second set 6-4, sending it into a third set. Bermudez proved to be too much though, taking the final set 6-1 to make it 4-0. It looked as though Manso was going to suffer his first loss of the season, dropping the first set 4-6, and trailing 4-5 in the second set to Sharon junior Danujan Thirumavalavan. But the freshman got stronger as the match went on, tying it at 6-6 to send it into a tiebreaker. Manso emerged with a 7-4 decision in the tiebreaker to tie it 1-1 and sending it into a third set. Manso took care of business in the third set, giving North it’s fifth point with a 6-3 win. The two teams will meet again on May 23rd, which is currently North’s last league game. The Rocketeers now hold the longest streak for boys tennis with 11 straight league wins, all coming this season. North Attleboro boys tennis (11-0 Hockomock, 11-0 overall) is back in action on Friday when it travels to Franklin. Sharon (9-1, 9-1) is back in action on Thursday, hosting Bishop Feehan. Foxboro, 0 @ Canton, 6 – Final – Canton’s Robbie Wilkinson tossed a complete game shutout, allowing just two hits to help the Bulldogs not their second win of the season. Offensively, Matt Casamento went 3-for-3 with an RBI and two runs scored and Matt Pigeon had two hits and three RBI for Canton. Mansfield @ King Philip – Postponed to a date and time to be announced. Attleboro, 0 @ Taunton, 12 – Final (6 inn.) – Kelsey White allowed just two hits in four innings of work, striking out five to help the Tigers earn a shutout win over visiting Attleboro. Jaylin Couto struck out four in two innings of relief work. Offensively, McKenzie McAloon went 3-for-4 with a pair of runs scored and an RBI, Jaime Brown was 2-for-2 with two RBI and two runs, and Kya Enos had two hits, two runs, and a stolen base. Mackenzie Handrahan added a pair of hits, two RBI, and two runs while White helped her own cause with a double, triple, and two runs scored. Foxboro, 5 @ Canton, 6 – Final – Canton freshman Steph Trendell had two singles, including the game-winning RBI in the bottom of the seventh as Canton walked off with a win over visiting Foxboro. Trendell knocked in classmate Nikki Desjardins from second on a two-out hit to get the win. Freshman Liz Bickett added three hits in the win, including a home run and sophomore Caroline Hughes added two hits for the Bulldogs. Stoughton, 8 @ Sharon, 4 – Final – Stoughton built and 8-0 lead going into the bottom of the seventh inning before the Eagles rallied for four runs in the final frame, but Sharon couldn’t sustain the rally and lost its home opener. Lexi Baptista went 4-for-4 for the Black Knights with three triples and a single, drove in a pair of runs and scored three times. Gina Carafa earned the win with a complete game, striking out 10 while also going 2-for-4 at the plate with an RBI. Jamie Kessler drove in a pair of runs with a single in the seventh and Rebecca Clayman plated two more with a double for Sharon. King Philip @ Mansfield – Postponed to a date and time to be announced. North Attleboro @ Milford – Postponed to Thursday, 5/31 at 3:45. Attleboro, 5 @ Oliver Ames, 12 – Final – Eric LeBlanc had four goals and Owen Gallagher had three goals as Oliver Ames picked up a win over visiting Attleboro. Shane Kilkelly and Sandro Mascierelli each scored twice and Hunter Costello chipped in with one goal. OA head coach Ben Devlin said Frankie Ireland (three assists) had a great all-around game and Shane Murphy, Matt Saba, Mark Vasapollo, and Cullen Gallagher all had strong games defensively for the Tigers. Mansfield, 5 @ Franklin, 13 – Final – With Mansfield’s defense focused on Franklin All American Eric Civetti (two goals), Panthers’ freshman Matt Lazzaro stepped up and netted a team-high four goals to lead the way. Zach Alexander, Will Davis, and Chase Tanner all had two goals apiece while Nitin Chaudhury scored once and had one assist. Connor O’Rourke made eight saves in net for the Panthers. Oliver Ames, 20 @ Attleboro, 8 – Final – Attleboro used a second half surge to get the deficit to five (12-7) but Oliver Ames closed the door with a big run to end the game. Seven different players scored for the Tigers, led by seven goals and three assists from Olivia Piazza and four goals and one helper from Chloe Kilkelly. Franklin, 18 @ Mansfield, 4 – Final – Frankin jumped out to a 10-1 lead at halftime and never looked back against the Hornets. Kelsey MacCallum paced the offense with three goals and two assists, Annie Walsh added four goals and four draw controls, Hailey Toolin chipped in with a pair of goals and four draws, and Haley DeStefano finished with a goal and an assist. Gianna Cameron made six saves in net for Franklin. King Philip, 3 @ Mansfield, 2 – Final – King Philip’s second doubles team of Aidan Ignatius and Nick Ihley pulled out a 7-5, 7-5 win to help secure the win for the visiting Warriors. Nick Putney grabbed a 6-1, 6-0 win at second singles and Jack Cannon notched a 6-2, 6-2 win at third singles for KP’s other two wins. Mansfield’s Luke Nickerson secured a 6-0, 6-1 win at first singles and the team of Jalaj Singh and Sethu Odayappan won 7-5, 6-3 at first doubles. North Attleboro, 5 @ Milford, 0 – Final – North Attleboro senior Jack Redding prevailed with a 6-4, 7-5 win at third singles to help Big Red complete the sweep and continue its unbeaten start to the season. Richard Bermudez (first singles), Christian Bermudez (second singles) and the team of Ben Pfeffer and Vikram Senthilakumaran (first doubles) each won 6-0, 6-0 for North. The team of Alex Pfeffer and Sam Gallagher won 6-1, 6-0 at second doubles. Stoughton, 0 @ Sharon, 5 – Final – Sharon senior Fred Bondar recorded a 6-3, 6-3 win in a tight match at first singles to help the Eagles complete the sweep. Danujan Thirumavalavan won 6-1, 6-0 at second singles and Ashwin Sreevatsa won 6-0, 6-1 at third singles. The team of Max Brody and Russell Rapaport didn’t lose a game in their match at first doubles and Alex Aspel And Arie Chinnappan won 6-1, 6-0 at second doubles. Taunton, 4 @ Attleboro, 1 – Final – Taunton lost just two games total in its two doubles matches, helping the Tigers pick up a 4-1 win on the road. McKenzie Lucie and Samantha Martin didn’t lose a game in a win at first doubles and Amanda Pugh and Brianna Fevrier won 6-0, 6-2 at second doubles. Senior Jillian Pagliuca won 6-1, 6-1 at first singles and eighth-grader Kayla Parrett notched a 6-3, 6-1 in her varsity singles debut. Attleboro’s Brianna Aronne pulled out a 7-6 (7-4), 5-7, 10-2 win ay second singles. Foxboro, 4 @ Canton, 1 – Final – Foxboro picked up a pair of wins in singles and another two wins in doubles play to beat Canton. Sophia Prinos won 6-0, 6-0 at first singles and Julia Muise recorded a 6-1, 6-3 win at third singles. The team of Sarah Prag and Olivia Dantona picked up a 6-1, 6-2 win at first doubles and Foxboro’s Kendall Milender and Margaret McAuliffe prevailed at second doubles with a 6-3, 2-6, 10-8 win. Canton freshman Rachel Kupferman won 3-6, 6-1, 12-10 at second singles. Mansfield, 0 @ King Philip, 5 – Final – King Philip won all five matches in straight sets, getting a win over Mansfield at home. Erin Regnier won 6-0, 6-0 at first singles, Meghan Sepich notched a 6-0, 6-2 win at second singles, and Caitlin Gonser recorded a 6-0, 6-1 victory at third singles. The team of Mia Valencia and Grace Ely took a 6-2, 6-4 decision at first doubles and Hannah Putney and Lucy Barnard picked up a 6-2, 6-2 win at second doubles. Attleboro, 6 @ Oliver Ames, 5 – Final (8 inn.) – Oliver Ames took a 4-0 lead early and had a 5-2 lead going into the seventh inning but the Bombardiers took advantage of a couple of Tiger miscues to get the win. Drew Pagano (walk) and Sam Larkin (HBP) reached, and then Rob Furtado delivered a two-out RBI single to bring Big Blue within two runs. With the bases loaded, Larkin and Furtado came in to score on an infield error to tie the game. In the top of the eighth, Larkin (2-for-2, three runs) drew a one-out walk and advanced to second. After stealing third, Larkin came home to score the go-ahead run on an error. Jon Candiales, who inherited runners at first and second with no outs, got the final three outs. Michael Mulrean had a strong outing for OA, going six-plus innings with nine strikeouts. Chris Pearsons went 2-for-4 with a double and an RBI for the Tigers. Milford, 11 @ Foxboro, 2 – Final – Milford plated four runs in the second inning, tacked on three more in each the third and fourth innings and added one more in the fifth to pick up its first win of the season. Matt Shaver went 3-for-5 with a double and three RBI while Nick Marcolini had two hits, three runs and a pair of stolen bases. Dan Corsini earned the win, scattering five hits in six innings, striking out three with one earned run allowed. Foxboro’s Devin Hassett was 3-for-3 with a double and scored both of the Warriors’ runs. Mansfield, 0 @ Franklin, 2 – Final – Franklin senior Jake Noviello was spectacular again, firing his second straight complete game shutout to help the Panthers edge Mansfield. Noviello allowed just one hit, walked four and had one strikeout to earn the win. Noviello took the no-hitter into the final inning before Mansfield’s Dan Saraceno had a base hit to lead off the seventh. Franklin scored a run in the third, and then again in the fourth. Jack Nally had a double and scored a run for Franklin, Alex Haba added an RBI double, Evan Wendell scored a run, and Colby Fitzgibbons had an RBI double. Mansfield sophomore John Carney allowed just one hit and two walks over 2.1 innings of work in relief. King Philip, 6 @ Taunton, 5 – Final – King Philip scored a run in the top of the first, tacked on three more in the top of the second, plated one more in the fourth, and score what turned into the winning run in the top of the sixth. Taunton tied the game 5-5 in the bottom of the fifth before KP took the lead back for good in the next half inning. Liam Rohan came in to pinch hit and drove in Nolan Bradley for the winning run. Jeremy Rhines struck out a pair and gave up three earned runs in five innings of work while junior Terry Murray didn’t allow a run in two innings, striking out four. Rhines added a single and an RBI as well. North Attleboro, 12 @ Stoughton, 0 – Final – Click here for a recap of this game. Oliver Ames, 2 @ Attleboro, 14 – Final (5 inn.) – Attleboro pushed across 11 runs in the second inning in a big win over visiting Oliver Ames. AHS freshmen Autumn O’Connell went 3-for-3 and scored twice in the second inning while freshman Lora Woyton (2-for-3) cleared the bases with a double. Jordyn Lako added two RBI and two runs for the Bombardiers. Emily Gittle struck out four in five innings of work, allowing two runs with no walks. Oliver Ames’ Lexie Campbell (1-3) scored both of the Tigers’ two runs on RBI singles from Katie Abreu and Caroline Mahoney. Sharon, 0 @ Canton, 16 – Final (5 inn.) – Sharon got a pair of hits from Jody Goldenberg and a long single to center from Lauren Yaffe. Foxboro, 4 @ Milford, 16 – Final (6 inn.) – The Hawks broke the game wide open with an eight-run second inning and collected 20 hits as a team. Emily Piergustavo led the way for Milford with three hits, including a homer, and five RBI. Emily Hartman also went 3-for-5 with a homer and two RBI and Kelley Reichert went 3-for-5 at the plate with three RBI and also allowed one earned run in six innings, striking out eight. Sabrina Haarstick had two hits and three RBI. Jess Tomaso had two hits and scored two runs, and Shannon Cormier reached base four times and scored twice. Franklin, 8 @ Mansfield, 2 – Final – Franklin scored two in the first inning, one each in the fifth and sixth innings, and then put the game away with four in the seventh. Emily Valentino picked up the win, while striking out 12 and allowing just five hits. Franklin coach Kate Fallon said that the Panthers played “solid defense,” including catcher Maggie Hobby, who also hit a two-run double in the seventh to extend the lead. Anna Balkus went 2-for-3 with an RBI and Kylie Bouzan was 3-for-4 with two RBI and a run scored for the Panthers. Franklin finished with 14 hits as a team. Stoughton, 3 @ North Attleboro, 9 – Final – Bella Erti struck out 11 in a complete game victory, allowing only four hits and walking none. Emily Nardelli and Erti both hit homers for the Rocketeers, while Abby Gallagher had a pair of hits and a diving catch. Andrea Miceli, Erti, and Gallagher each drove in two runs for North. For Stoughton, Jordan Lyons went 2-for-3 with a double while Nikki Cappola and Gina Carafa each had a single. Canton, 8 @ Pembroke, 6 – Final – Canton built a 6-3 lead at halftime, led by the same score going into the fourth and held on for a win on the road at Pembroke. The Bulldogs never trailed in the win. Dan Cohen led the scoring with four goals while Kevin Albert scored two goals and had one assist. Sophomore Brendan Clifford scored his first career goal on perfectly placed snipe and classmate Jack Connolly made 15 saves in net for the Dogs. Foxboro, 16 @ Medway, 8 – Final – Foxboro continued its undefeated start, moving to 8-0 with a win over Medway. Louis Piccolo scored a team-high seven goals and added three assists while Brendan Tully registered five points (three goals, two assists) for the Warriors. Bobby Yerardi added three goals while Andrew Whalen (two goals, one assist) and Pete Conley (goal, two assists) each had three points. Jake Addeche made nine saves in the win for Foxboro. Oliver Ames, 18 @ Dighton-Rehoboth, 2 – Final – Oliver Ames had six different players score multiple goals in a win over D-R. Eric LeBlanc, Owen Gallagher, Shane Kilkelly, Colin Bourne, Sandro Masciarelli, and Sam Stevens all had multiple goals for the Tigers. Stoughton, 0 @ Sharon, 12 – Final – Sharon’s Brett Litner (two goals, three assists) and Drew Litner (one goal, four assists) each recorded five points as the Eagles rolled to a win. Kadin Nestler chipped in with a pair of goals and an assist while Daniel Lillenfield added two goals as well. Taunton, 16 @ Coyle & Cassidy, 2 – Final – Taunton freshman Alana Tavares paced the offense with eight goals while senior Hannah Moniz scored four goals and senior Kayla Phillips added a pair. Senior Diana Brens and freshman Anastasia Lajoie each found the back of the net once. Goalie Brianna Winfield made eight saves in the win. Franklin, 6 @ Natick, 5 – Final – Franklin sophomore Erin Walsh scored the game-winning goal inside the final minute to lift the Panthers to a win on the road at Natick. Erin Walsh and Annie Walsh each finished with two goals and one assist in the win. Kelsey MacCallum added two assists while Nicole Houlihan and Katie Jones each had one goal. The Panthers played well defensively, with Corinne Lewis grabbing two ground balls and forcing three turnovers. Sophomore Gianna Cameron made seven saves in net. King Philip, 5 @ Walpole, 19 – Final – Caroline Klim and Alli Meehan each scored twice, but the Warriors lost for the first time this season. Ali Wilson also scored for KP. Mansfield, 9 @ Old Rochester, 13 – Final – Ann Maher scored four goals and Katy Garvin added three for the Hornets in the loss. Oliver Ames, 7 vs. Silver Lake, 15 – Final – Oliver Ames’ Sofia Masciarelli scored three goals and added one assist but the Tigers fell at home against Silver Lake. Olivia Piazza added four assists and Ella Hogan had a hat trick for OA. Oliver Ames, 0 @ Attleboro, 5 – Final – Attleboro defended home court, winning four of the five matches in straight sets. Evan Capar won 6-1, 1-6, 10-7 at first singles to complete the sweep. Jared Cooper (6-2, 6-1) and Ryan Gordon (6-3, 6-1) won at second and third singles, respectively. The team of Luis Sandoval and Hans Estrada won 6-2, 6-4 at first doubles while Zach Brown and Ryan Solari picked up a 6-4, 6-0 win at second doubles. Sharon, 5 @ Canton, 0 – Final – Sharon’s Fred Bondar overcame a one-set deficit to earn a 3-6, 6-3, 6-3 win at first singles, helping the Eagles complete the sweep on the road. Andre Olivei won 6-1, 6-4 at second singles and Danujan Thirumavalavan picked up at 6-1, 6-0 victory at third singles. Junior Max Brody and sophomore Alberto Olivei teamed up for the first time this season for a 6-0, 6-0 win at first doubles while senior Russell Rapaport and junior Arie Chinnappan won 6-1, 6-0 at second doubles for Sharon. Franklin, 4 @ Mansfield, 1 – Final – The Panthers won a pair of matches at singles and swept doubles play to beat Mansfield. Both of Franklin’s doubles teams overcame first set deficits to get the wins. Tyler DiPalma and Derek Wu rallied for a 6-7 (2-7), 6-2, 6-2 win at first doubles and Tony Calderone and Dan Angermeier came back with a 2-6, 7-6 (7-3), 7-5 win. Freshman Liam Marr didn’t lose a game (6-0, 6-0) at second singles and Tyler St. Marie earned a 6-2, 1-6, 6-2 win at third singles. Mansfield’s Luke Nickerson won 6-1, 6-1 at first singles. Taunton, 0 @ King Philip, 5 – Final – King Philip won all five matches in straight sets, sweeping visiting Taunton. Marco DiStefano won 6-2, 6-3 at first singles, Nick Putney earned a 6-0, 6-1 win at second singles, and Jack Cannon took a 6-1, 6-1 decision at third singles. The team of Nick Ihley and Aidan Ignatius notched a 6-1, 6-0 win at first doubles while Nate Ihley and Sean Desrochers teamed up for a 6-0, 6-1 win at second doubles. Stoughton, 0 @ North Attleboro, 5 – Final – Senior Christian Bermudez, freshman Jonah Manso, and the team of sophomore Alex Pfeffer and freshman Sam Gallagher all won their respective matches without losing a game. Christian Bermudez won at second singles, Manso took the win at third singles and Pfeffer and Gallagher won at second doubles. North senior Richard Bermudez won 6-0, 6-1 at first singles and the team of senior Ben Pfeffer and junior Vikram Senthilakumaran won 6-2, 6-0 at first doubles. King Philip, 5 @ Taunton, 0 – Final – King Philip picked up an impressive win, taking all five matches in straight sets on the road at Taunton. Erin Regnier won 6-3, 6-0 at first singles, Meghan Sepich took a win at second singles by the same score, and Caitlin Gonser didn’t lose a game (6-0, 6-0) in a win at third singles. The team of Katarina Schneider and Grace Ely emerged with a 6-0, 7-5 win at first doubles and the team of Mia Valencia and Lucy Bernard took a 6-1, 6-1 decision at second doubles. Attleboro, 0 @ Oliver Ames, 5 – Final – Oliver Ames defended home court, winning all five matches in straight sets to sweep visiting Attleboro. Junior Sarah Leger won 6-1, 6-2 at first singles, sophomore Tate Hadges lost just one game in a 6-1, 6-0 victory at second singles, and sophomore Sarah Barron emerged with a 6-4, 6-2 win at third singles. The team of seniors Kristin Bloumbas and Emily Yu took home a 6-1, 6-2 win at first doubles and seniors Rachel Stryke and Olivia Groebe notched a 6-0, 6-3 victory at second doubles for the Tigers. Canton, 0 @ Sharon, 5 – Final – Canton freshman Rachel Kupferman became the first player to win a game against Sharon’s Lulu Yuan this season, but Yuan prevailed 7-5, 6-1 at second singles as the Eagles came up with a sweep. Nupur Shukla (6-0, 6-0) and Lauren Glass (6-2, 6-4) completed the sweep in singles play for Sharon. Katie Merport and Anjali Mandal won 6-1, 6-0 at first doubles and Sophia Fein and Sophia Le earned a 6-2, 6-2 decision at second doubles. Milford, 0 @ Foxboro, 5 – Final – Foxboro picked up a clean sweep at home, knocking off Milford with all five matches ending in two sets. Sophia Prinos earned a 6-1, 6-1 win at first singles, Pamela Nelson didn’t drop a game in a win at second singles, and Kayla Prag picked up a 6-2, 6-2 win at third singles. The team of Julia Muise and Sarah Prag won 6-1, 6-1 at first doubles while Olivia Dantona and Kendall Milender teamed up for a 6-0, 6-0 win at second doubles. Mansfield, 4 @ Franklin, 1 – Final – Mansfield picked up two wins in singles and swept doubles play to record a win on the road at Franklin. Senior Sarah Doyle didn’t drop a game in a 6-0, 6-0 win at first singles and Elizabeth Elsner earned a 6-0, 6-2 win at second singles for the Hornets. The team of Tessa Garufi and Hannah Podolske continued their strong start with a 6-2, 6-1 win at first doubles and sophomore Sam Sternberg and freshman Aryann Khosravani won 6-2, 6-4 at second doubles. Franklin senior Emmy Mahoney won 6-0, 6-1 at third singles for the Panthers. North Attleboro, 5 @ Stoughton, 0 – Final – North Attleboro senior Leah Marceau and junior Tara Nair won a tiebreaker 7-4 to take the second set and earn a win (6-3, 7-6 (7-4)) at first doubles, helping the Rocketeers win all five matches in straight sets. Senior Jordan Willis won 6-0, 6-0 at first singles and classmate Emily Chiasson won by the same score at second singles. Senior Azka Siddiq won 6-2, 6-1 at third singles for North while seniors Shurobhi and Monica Nakhla earned a 6-0, 6-1 win at second doubles. Attleboro, 6 @ King Philip, 2 – Final – Attleboro senior James Weir shined on the mound, allowing just two hits with four strikeouts in a complete game effort. Weir earned the win with just one earned run allowed. Eoin Kelleher (double) and Dakota Kirby each had a pair of hits for the Bombardiers along with an RBI each. Jon Candiales added a pair of hits and three runs scored for Attleboro. Foxboro, 3 @ Sharon, 8 – Final – Sharon junior Noah Kamens tossed a complete game without allowing an earned run to help the Eagles pick up their first win of the season. Kamens stuck out four while walking three in the win. Senior Drew Naisuler went 2-for-2 with two runs scored and an RBI while junior Jared Reef added two hits, an RBI, and a run scored. Canton, 2 @ North Attleboro, 6 – Final – North Attleboro broke open a tie game with three runs in the top of the fourth and then escaped a bases-loaded jam in the fifth to earn a win over Canton. In his varsity debut, senior Ben Arrighi came on with the bases loaded in the top of the fifth and induced a ground ball to get out of the inning. Arrighi then escaped another bases loaded jam in the top of the seventh to earn the save (2.1 IP, 0 R). Jeff Gale went a perfect 4-for-4 at the plate, including a triple, and had an RBI single in the sixth inning to put Big Red up 6-2. Nick Sinacola added two hits while Peter Cohen earned the win on the mound. Canton’s Matt Casamento had a two-run home run in the third that tied the game 2-2. Franklin, 5 @ Oliver Ames, 2 – Final (8 inn.) – Click here for a Recap and Photo Gallery from this game. Taunton, 3 @ Mansfield, 1 – Final – Mansfield took the lead in the bottom of the first inning but Taunton answered with three runs in the top of the second to earn the win. Jack Moynihan earned the win on the bump, scattering five hits with five strikeouts and just on unearned run allowed. Josh Lajoie didn’t allow a hit in two innings of relief, striking out four to earn the save. Offensively, Trevor Pietrzyk (2-for-4) knocked in one run and Jacob Crawford had two RBI. Moynihan also had a hit and scored a run. For Mansfield, Sam Nugent went 2-for-3 and Tyler Dalton had an RBI single. Sophomore John Carney struck out five without allowing a hit in 3.2 innings of relief. Stoughton, 10 @ Milford, 3 – Final – Stoughton’s offense exploded for seven runs in the top of the eighth inning to pick up a victory on the road. Sophomore James Genest went 3-for-5 (double, run, RBI), while Ruben Gonzalez (double, run), Robbie Seaman (double, two runs), and George Currier (run, RBI, SB) each had two hits. Sophomore Michael Nazzaro chipped in with a two-run double. Zak Paquette started for Stoughton and went 5.1 innings, allowing three runs (1 earned) on five hits with seven strikeouts. Junior Evan Gibb got the win pitching 2.2 scoreless innings allowing just one hit. King Philip, 7 @ Attleboro, 1 – Final – King Philip’s Elise Pereira allowed just four singles and one run while striking out 12 batters to lead the Warriors to a win on the road. Brianna Lacy paced the offense with three hits, including a home run. Faith Turnese added two hits and Sydney Phillips had two RBI in the win. North Attleboro, 20 @ Canton, 0 – Final – Bella Erti (three innings, one hit allowed) and Jaclyn Buckley (two innings and two hits allowed) combined for the shutout for North, which has scored at least 20 runs in each of its two games this season. Ashley Cangiano and Olivia Capobianco each went 3-for-3 with a homer and two RBI, while Abby Warren went 3-for-3 with two triples and six RBI. Erti also went 3-for-3 at the plate and drove in a pair and Emily Nardelli had one RBI and three runs scored. North coach Bill Wallace said Andrea Miceli had a great game in the field. Sharon, 7 @ Foxboro, 18 – Final – Foxboro seniors Hannah Davis and Mandy Ryan, and freshman Nicole Theriault each had three hits to pace the Warriors to a big win at home. Junior Emma Rohan recorded 10 strikeouts for the Warriors. Oliver Ames, 3 @ Franklin, 15 – Final (6 inn.) – Franklin scored five runs in the first inning and never looked back to secure its first win of the season. The Panthers tacked on four more in the second, five more in the fourth and a single run in the sixth inning. Kylie Bouzan and Meg Caron finished with two RBI apiece while Emily Valentino earned the win, striking out four while scattering six hits. For Oliver Ames, Marissa Guarino was 1-for-2 with a double and a run scored, Kayla Georgeu added a double, and Katie Abreu scored a run. Mansfield, 4 @ Taunton, 13 – Final – Taunton sophomore Jaylin Couto allowed just one earned run on four hits in four innings of work. Couto also struck out four while Kelsey White finished with three innings of no-hit ball with three strikeouts. McKenzie McAloon (3-4, two doubles, three RBI), Hanna Aldrich (2-3, two doubles, three RBI), Jaime Brown (2-3, double), Kya Enos (1-2, two RBI), and Kelsey White (triple, two RBI) paced the Tigers’ offense. Grace Benton went 2-for-3 on the game for the Hornets, recording half of the team’s hits on the day. Milford, 4 @ Stoughton, 1 – Final – Milford rallied for four runs in the top of the seventh inning to escape Stoughton with a win. The Hawks put the bat on the ball but Stoughton played phenomenal defense to keep them off the board for six innings. In the top of the seventh, Emily Hartman (2-for-2, run) led off with a double, Shannon Cormier walked and Maddy Bonvino loaded the bases with a bunt single. Kelley Reichert gave Milford the lead with a two-run single and Sabrina Haarstick gave the Hawks insurance with another two-run single. Antonia Bonina had another strong day offensively, going 3-for-3 while Reichert earned the win, striking out seven with three hits allowed and just one unearned run. Stoughton took the lead when Nikki Coppola led off the bottom of the first with a walk, took second on an error and scored on a ground ball to short from Jordan Lyons. Gina Carafa tossed a complete game for Stoughton, allowing just six hits. Milford, 2 @ Canton, 14 – Final – Canton senior Charlie O’Connor made his season debut and didn’t lose a face off, scoring two goals as well, to help the Bulldogs pick up a win over visiting Milford. The Bulldogs had eight different players score a goal including junior Teddy MacDonald, who notched his first career goal. Freshman goalie Dylan Coyne had a shutout in net in the fourth quarter for Canton. Stoughton, 1 @ Foxboro, 19 – Final – Louis Piccolo recorded six points while Andrew Whalen and Pete Conley each picked up five points as Foxboro improved to 4-0. Piccolo had three goals and three assists, Whalen scored once and had four assists, and Conley scored four times and chipped in with one helper. Oliver Ames, 7 @ North Attleboro, 17 – Final – North Attleboro senior Jason McNeany dominated the face off X (18-for-20) to help the Rocketeers pick up a win at home over OA. Sophomore Andy DeMattio scored five goals, Damien Curtis scored four goals, and McNeany added four points in the win. Nate D’Amico made eight saves in net for the Rocketeers. Eric LeBlanc had three goals for Oliver Ames while Shane Kilkelly found the back of the net twice. Sharon, 14 @ Taunton, 0 – Final – Brothers Brett and Drew Litner each finished with six points to pace the Eagles to a win on the road. Brett had five goals and one assist while Drew had one goal and five assists. Kadin Nestler added three goals for Sharon while Johnny Greenberg posted the shutout. Taunton, 2 @ Sharon, 15 – Final – Sharon coach Shara Ginthwain called the Eagles’ win a “total team effort,” as eight different players scored goals. Sabrina Robbins had another strong overall game with three goals, three assists, and six ground balls, while Emma Eberhardt also finished with a hat trick and three assists and added 10 draw controls as well. Freshman Jenna Goldstein made it a hat trick of hat tricks for the Eagles and Cass Barbera chipped in with six ground balls. Taunton’s Hannah Moniz and Alana Tavares each scored once while Lorna Li made 11 saves in net. Attleboro, 3 @ Franklin, 20 – Final – Halle Atkinson and Shannon D’Arcangelo each recorded three goals to pace the Panthers to a win at home. Alex Field scored her goal of the season while Victoria Quinn had a strong game in midfield with four draw controls. Grace MacCallum anchored the defense with three ground balls. Canton, 7 @ Milford, 6 – Final – Maggie Connolly scored a first half hat trick to help the Bulldogs pull out their first win of the season and first under new coach Laurie Chabot. King Philip, 12 @ Mansfield, 8 – Final – KP made it three wins in three games to start the season with six different players finding the back of the net. Katie Crowther and Caroline Klim each scored three goals for the Warriors, while Alli Meehan added two goals and an assist, Dana Truini had a pair of goals, Jess Sullivan had a goal and an assist, and Olivia Tormey scored in the win. Caroline Watson made 13 saves in the win. North Attleboro, 18 @ Oliver Ames, 10 – Final – For Oliver Ames, Ella Hogan and Olivia Piazza each netted three goals while Chloe Kilkelly and Sofia Masciarelli added two goals apiece. King Philip, 5 @ Attleboro, 0 – Final – King Philip lost a total of three games in singles play on its way to a sweep on the road at Attleboro. Marco DiStefano won 6-2, 6-0 at first singles, Nick Putney didn’t lose a game in a win at second singles and Jack Cannon took a 6-0, 6-1 decision at third singles. The team of Nick Ihley and Nate Ihley registered a 6-0, 6-1 win at first doubles and Zak Ryan and Jake Mager made their varsity debuts with a 6-2, 6-2 win at second doubles. North Attleboro, 5 @ Canton, 0 – Final – North Attleboro picked up its third win of the season, sweeping Canton on the road. Senior Richard Bermudez won 6-1, 6-0 at first singles and Christian Bermudez won with the same score at second singles. Freshman Jonah Manso won 6-0, 6-0 at third singles. The team of Ben Pfeffer and Vikram Senthilkumaran won 6-0, 6-1 at first doubles and Alex Pfeffer and Sam Gallagher teamed up for a 6-2, 6-0 win at second doubles. Sharon, 5 @ Foxboro, 0 – Final – Sharon picked up its third win of the season with a sweep on the road against division foe Foxboro. Fred Bondar notched a 6-1, 6-2 win at first singles, Andre Olivei picked up a 6-0, 6-2 win at second singles and Danujan Thirumavalavan didn’t lose a game at third singles. Junior Max Brody and senior Russell Rapaport won 6-0, 6-2 at first doubles while Sharon’s pairing of Ashwin Sreevatsa and Arie Chinnappan, won 6-0, 6-0 at second doubles. Oliver Ames, 0 @ Franklin, 5 – Final – Franklin earned a clean sweep, dropping just one game in the five matches. Rohan Herur and Saketh Saripalli each won 6-0, 6-0 at first and third singles, respectively. Liam Marr recorded a 6-0, 6-1 win at second singles for the Panthers. The team of Tyler DiPalma and Derek Wu (first doubles) and the pairing of Tony Calderone and Dan Angermeier (second doubles) each won 6-0, 6-0. Milford, 0 @ Stoughton, 5 – Final – Stoughton picked up its first win of the season, sweeping Milford. Freshman Waseem Sablon picked up a 6-1, 6-1 win at first singles, junior Erik Anderson recorded a 7-5, 6-1 win at second singles and LJ Fernandiz won 6-3, 6-3 at third singles. Stoughton’s team of Hassan Khan and Andrew Chiang won 6-1, 6-1 at first doubles and the pairing of sophomores Brendon Buckley and Mike Veliotis won 6-0, 6-3 at second doubles. Taunton, 5 @ Mansfield, 0 – Final – Taunton won in straight sets in all five matches to notch a victory on the road. Jillian Pagliuca won by default at first singles, senior Vanessa Rosa won 6-1, 6-3 at second singles, and freshman Jocelyn Pagliuca earned a 6-2, 6-3 win at third singles. The team of juniors McKenzie Lucie and Sam Martin won 6-3, 6-3 at first doubles for the Tigers and senior Amanda Pugh and junior Brianna Fevrier won 6-1, 6-0 at second doubles. Canton, 1 @ North Attleboro, 4 – Final – North Attleboro picked up a pair of wins in both singles and both doubles to beat Canton. Senior Jordan Willis won 6-0, 6-0 at first singles and senior Katie Ovoian won 6-1, 7-5 at second singles. The team of seniors Leah Marceau and Shurobhi Nandi won 6-0, 6-3 at first doubles while juniors Mae McLaughlin and Tara Nair emerged with a 6-3, 6-1 win at second doubles. Canton freshman Rachel Kupferman won 6-0, 6-1 at second singles. Foxboro, 2 @ Sharon, 3 – Final – Sharon emerged with a 3-2 victory in a showdown with division rival Foxboro. The Eagles picked up wins at second singles and both doubles matches. Lulu Yuan won 6-0, 6-0 at second singles, Katie Merport and Emily Wen prevailed with a 6-2, 6-1 win at first doubles and Rithika Neti and Sophia Fein teamed up for a 6-2, 6-2 win at second doubles. Foxboro’s Sophia Prinos won 6-2, 7-5 at first singles and freshman Pam Nelson earned a 6-0, 6-2 win at third singles. Franklin, 0 @ Oliver Ames, 5 – Final – Oliver Ames defended its home court with a sweep of visiting Franklin. Sarah Leger won 6-1, 6-0 at first singles, Tate Hadges took a 6-0, 6-1 decision at second singles and Maura Kiernan didn’t lose a game in a win at third singles. The team of Kristin Bloumbas and Emily Yu recorded a 6-2, 6-0 win at first doubles while Rachel Stryke and Olivia Groebe prevailed 6-1, 6-1 at second doubles.